You have to go all they way back to the lumbering days for the history of the old Chevrolet Parts Plant on the corner of 6th and Washington. In 1906 Saginaw Business men Arthur Eddy and E.A. Robertson persuaded John T. Rainier to move his car company into the old Merschon-Schutte-Parker lumber mill on the corner of 6th and Washington. In the early 1900’s William C. Durant started purchasing automotive compaies to form General Motors, and in 1907 he purchased the Rainier Motor Co. and the plant on the corner. It’s name changed to the Marquette Motor Co. and by 1912 it had employed 244 workers, and produced 15 cars a week, but sales were slow and the plant closed in 1913. During WWI GM received a government contract to produce mortar shells, and the old plant was reopened, and production of the shells hit 25,000 in a 9 hour shift. 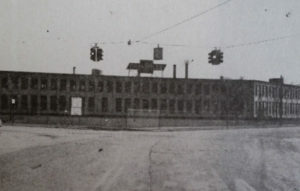 After the war, all the General Motors plants in Saginaw were united as the Saginaw Products Company Division, and the factory on the corner of 6th and Washington became the Saginaw Products Company Motor Plant. That’s when the the famous Chevrolet “Bow Tie” sign went up on the roof. 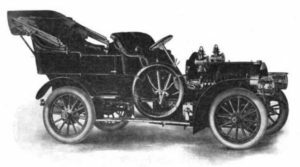 The plant produced the 4-cylinder engine for the “Baby Grand” Chevrolet touring car. In 1923 it re-tooled to manufactur the “sensational six” engine for General Motors. The plant was shut down in 1929 in the depths of the great depression, and used as a where house, until 1935, when it became part of the foundry, and was called the Chevrolet Saginaw Service Parts Plants, building engines and service parts. By the start of WWII, the plant was manufacturing 7 million different parts annually, such as connecting rods, clutch collars, pistons and pin assemblies. After production of new Chevrolet cars was stopped for the for the war, the plant continued making parts for armored cars and aircraft parts, along with replacement parts to keep the old Chevrolet running during those years Americans could not purchase new cars. At the end of the war, the plant was separated from the foundry, and became an independant plant for GM. In the 50’s, during the Korean War, the plant produced Wright Aircraft Parts. During the 60’s the plant continued to produce water pumps, oil pumps, camshaft assemblies, piston and pin assemblies for General Motors, and by 1969 the plant changed it’s name to the Chevrolet Saginaw Parts Plant. Throughout the 70’s the plant continued to produce water pumps, oil pumps and flywheels for the Pontiac 151 Ci 4-cylinder “iron duke” engine. During the 80’s the plants tooling was slowly moved to the Chevrolet plants in Bay City and Flint, and by 1983 the plant was empty, no longer manufacturing parts for GM. Shortly after that, the old plant that produced some of the first cars in America was torn down, and is nothing more than a field on the corner of 6th and Washington.